This book deals with the period when iron became the dominant ’high-technology’ material, increasingly taking over from timber and masonry. It was necessary for the engines and machines of the new industries, but equally vital for the vast civil engineering works which supported this industrialisation. It was these works - mills, warehouses, dockyards, and above all bridges - which so impressed the public in the early 19th century. The papers selected here trace the evolving structural uses of cast and wrought iron in frames and roofs for buildings, and look in particular at the development of bridge design and construction, in America, France, and Russia, as well as in Britain. They cover the processes of design and testing, and at the same time throw much light on the attitudes and careers of the engineers themselves. Contents: The use of cast iron in building, S.B. Hamilton; The first iron frames, A. W. Skempton and H.R. Johnson; The development of the cast iron frame in textile mills to 1850, R.S. Fitzgerald; The age of cast iron 1780-1850: who sized the beams?, R.J.M. Sutherland; Richard Turner and the Palm House at Kew Gardens, E.J. Diestelkamp; Matthew Clark and the origins of Russian structural engineering 1810-40s: an introductory biography, S.J Fedorov; Shipbuilding and the long span roof, R.J. M. Sutherland; James Finley and the modern suspension bridge, E.L. Kemp; Samuel Brown: his influence on the design of suspension bridges, T. Day; Navier and the introduction of suspension bridges in France, A. Picon; Ellet’s contribution to the development of suspension bridges, E.L. Kemp; The first iron bridges, B. Trinder; Early 19th-century developments in truss design in Britain, France and the United States, D.A. Gasparini and C. Provost; The introduction of structural wrought iron, R.J.M. 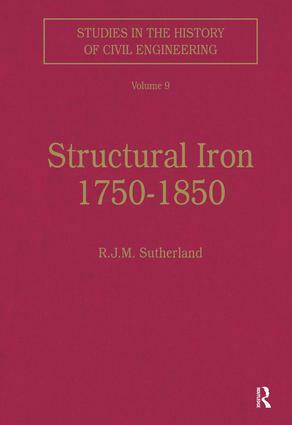 Sutherland; Structural model testing and the design of British railway bridges in the 19th century, D. Smith; The evolution of iron bridge trusses to 1850; J.G. James; Russian iron bridges to 1850, J.G. James; Index.